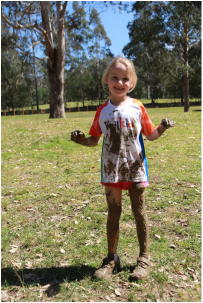 A Trail Kids trail running clinic is a 1 - 2 hour session of fun and interactive activities aimed at developing kids skills and confidence in running on trails, whilst having loads of fun! Oh and of course TRAIL RUNNING! Development of skills such as cooperation and teamwork, and is a great way to have fun, m﻿eet ne﻿w people and develop friendships and integration. Children feel more confident and happy, improve self-esteem and self-concept, sense of belonging, ability to sleep better, self expression and the opportunity to achieve through exercise. Physical activity has direct links to improved learning outcomes. Your child does not have to be 'a runner' to participate in these events. We will cater for all levels of fitness. We are passionate about being inclusive and encouraging ALL children to step into a more active lifestyle. * At times it may be appropriate for us to place your child in a younger, or more likely, older age group clinic. This may be due to weighting of ages and ability levels. We will endeavour to give parents as much notice as possible in this occurrence.